Hey there, my name is Jordan Syatt and I’m the owner, head coach, and lead author here on Syatt Fitness. I’m a 5x World Record Powerlifter, Precision Nutrition & Westside Barbell certified coach, and I’ve been featured in CNN, The Huffington Post, Men’s Fitness and more. Most importantly, I’ve helped hundreds of people just like you eliminate stubborn belly fat, gain strength, and build the body they’ve always wanted. If you want to see their results just click on the “Success Stories” tab above. And now it’s your turn. Are you ready to learn how to lose fat and gain muscle? Plug in your info below and I’ll send you 4 FREE fat loss and muscle gain manuals in less than 60-seconds. 4 FREE Manuals Sent Directly to Your Inbox! 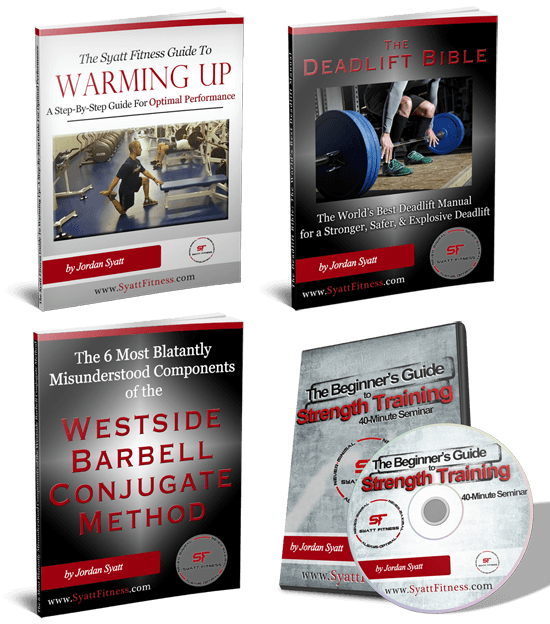 Plug in your info and I’ll send your free manuals directly to your inbox, plus get free access to the Syatt Fitness VIP Membership Community. I want to thank Jordan for his constant help and communication. His passion and expertise is clear as day and I cannot thank him enough. With his help I have managed to hit several new personal records in just 12 weeks and I look forward to many more with him by my side. In the short time we worked together, Jordan’s program transformed my strength and physique like I never imagined possible. His support throughout the process was unmatched and if I had to do it all over again, the only thing I would change was to hire Jordan sooner. I’m the strongest mentally and physically I’ve ever been in my life, and I have Jordan to thank for that. Physically, I am almost where I want to be and I am lucky enough to have Jordan not only as my coach, but as a friend to help me get there. If you want to get stronger and/or look better with your clothes off, don’t waste anymore time! Working with Jordan has been a absolute pleasure. He is quick to respond and always has SMART advice for lifting. He has the ability to identify weaknesses and take action immediately. He does not like to sugar coat things, he keeps things to the point and makes sure you are hitting your goals consistently. I am 100% positive that Jordan can help anyone reach there goals.